It's a construction set, Jim; but not as we know it. We were excited to recently learn that MEGA Bloks will soon release a new range of Star Trek building sets based on the original 1960s series. Which got us thinking: why hasn't there been any other Trek-based brick-building sets before? But there has. Hasbro got in there a couple of years ago after the release of Star Trek Into Darkness with their Kre-O range of toys. To check them out, we review the Klingon Bird of Prey. Yeah, we hadn't really heard of it either. 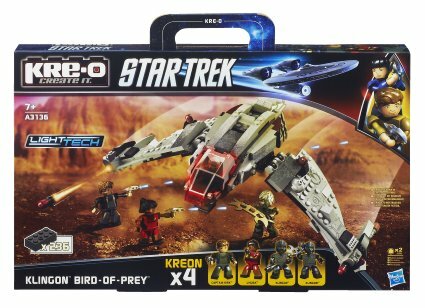 The Kre-O range is very similar to LEGO and has grabbed licenses such as Star Trek, Transformers, and G.I. Joe. We were keen to see how the range differs from LEGO and MEGA Bloks, and so chose a fairly decently sized set with a few figures. The Klingon Bird of Prey weighs in with 236 parts and four figures. 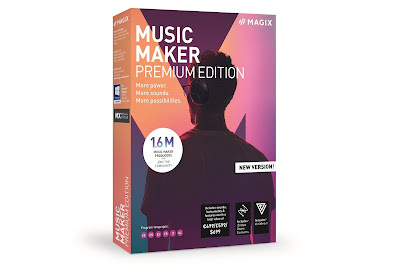 Let's have a look, shall we? If you've never seen Star Trek Into Darkness, and know the Klingons (and their iconic ships) from the 80s and 90s TV shows, you're probably thinking 'what the hell is that?!?' True, the redesigned Bird of Prey is less impressive than the huge, green, aggressive looking beast you might be used to, but the build here is actually pretty good. It took about an hour to put together and felt just like a LEGO set. Alarmingly like a LEGO set, in fact. Anyway, first up... the ship itself. We genuinely think this is a good model, being both faithful to the source material, and being a good toy. It uses multi-direction construction methods, has multiple moving parts, shooting guns on the wings, and even a light-up cockpit (more on that later). Kre-O bricks are basically identical to LEGO, and as well as being fully compatible with the Danish system (as MEGO Bloks also are) they also look and feel just like them too. No colour blending, as with MEGA Bloks, here. ... and also dropped down like the classic original ship. Here we used a transparent stand from another model to hold the ship aloft - you don't get one with the set, meaning you'll have to provide your own if you want to pose it like this. ... ours didn't fit! The top two stickers were slightly too long, meaning they spread over some studs, as above. As mistakes go, its not too bad, as you can easily cut them down. But still, it is a bit sloppy Hasbro. The canopy piece opens up to reveal the cockpit, into which a figure can happily... erm... recline. Also, note the red bricks behind the Klingon's head? ... the light-up effect!. This is actually pretty cool, and comes from a simple 3 X 2 brick with a LED light and battery built in. The white light from the brick is shining through some red transparent bricks, creating the eerie effect. We think it looks great, especially in the dark, and adds a whole other level of realism. Plus once you dismantle the ship you have a LEGO-compatible light brick to use in other builds. Score. The Klingon Bird of Prey also boasts a unique flick-fire missile system on the end of each wing. Different to anything LEGO or MEGA produce, these are three-part weapons which use the pressure from a top-side switch to force a rod out of a clip. Certainly they aren't very powerful, shooting a couple of feet at most, but we think they look a damn sight better than LEGO's annoying flicky ones. Onto the figures... Hasbro call these Kreons, and they are basically their version of minifigures with a few differences. Included are two Klingon warriors, Captain Kirk, and Lt. Uhura. As you can see, Kreons have a lot more in common with LEGO's minifigures, than MEGA's micro action figure range, but they do sit nicely in between the two in terms of articulation. Both the hip and shoulders are on ball-joints, while the waist of the figure can fully rotate as well. This means there is much more movement in a Kreon than a standard LEGO figure, but due to the realistic skin tone and facial detail, we can't help but feel a bit unnerved by them. Kirk and Uhura both come with phasers and also removable hair pieces which are made from a softer, rubbery kind of plastic. Kirk kinda looks okay, but poor Uhura is left with a weird small face and less-than-subtle thinning black blobs at her waist. You know, because she's a woman, kids. The Klingons are far more interesting, and despite being two identical figures, we really like them. Sure, the Klingons have also gone through a less-than-flattering redesign, but there is still enough there for older fans to recognise. And, most importantly, one of them comes with a bat'leth - the classic Klingon double-handed sword. 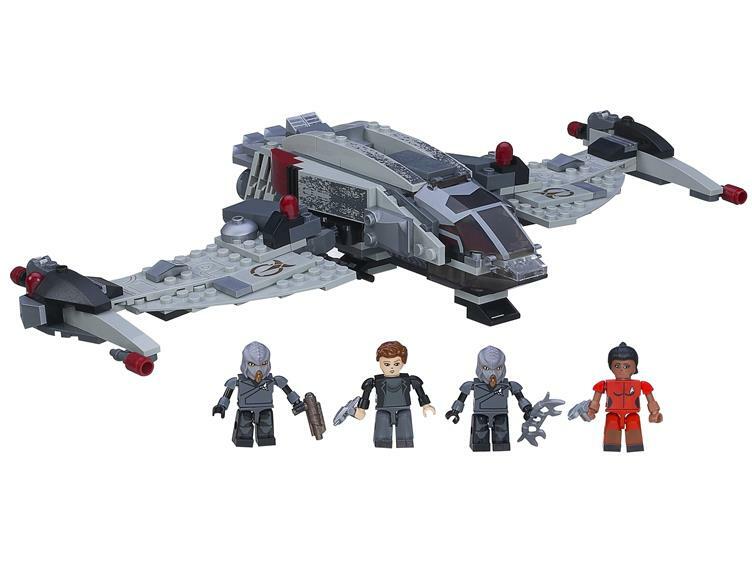 Also included in the set was the above brick. We're not sure if all Kre-O sets have these, but it seems to have a unique printed serial number on the back - perhaps a reference to the set? Either way, it is a nice bit of additional content, and we can imagine kids and grown-up collectors going after various sets to score these bricks. So certainly something a bit different! Yes, the choice of sets and themes on offer from Hasbro's Kre-O range are waaaaay behind those of LEGO and MEGA Bloks, but we had quite a bit of fun with this. The parts are basically LEGO, so if you can lay your hands on a set or two of Kre-O then at least you'll be getting some compatible parts. We love the light brick, we love the level of detail and playability, but we're not keen at all on those Kreon figures. Still, fans of Star Trek (and building sets in general) will get a a lot out of this, not to mention that the set can be picked up for less than £10 usually at many outlets.